I have to be honest and admit that I don’t personally subscribe to Dry January. Don’t get me wrong, it makes sense to review your health and body from time to time and make tweaks or overhauls as required and the start of the year is a good time as any to do it particularly if you have punished your liver and gut over the Christmas period but I am more about moderation rather than exclusion. But, whether its due to taking some time out from alcohol, not imbibing for health or cultural reasons, if you want to dine with us at Hood and keep to soft beverages then we have plenty for you to enjoy. 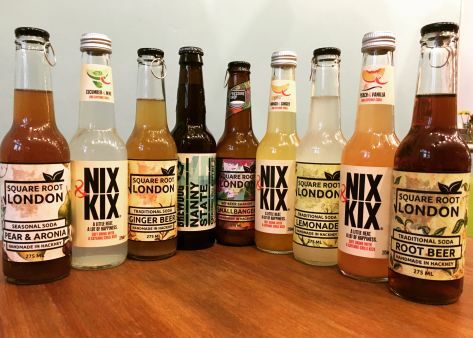 We stock bottled drinks from Square Root Soda Works and Nix & Kix with a great range of flavours including Mango & Ginger (with a kick of cayenne pepper), Root Beer, Cucumber & Mint and Smallbanger Shandy. We also have a first rate low alcohol beer (0.5%) amusingly named Nanny State from Brewdog. In addition we have the best locally roasted coffee from Volcano Coffeeworks (decaf available) and a range of teas from Birchall’s. Along with juices and a couple of mocktails we think we have most bases covered! So come on down for Weekday lunch, Weekend Brunch or Dinner (or the in-between hours) and enjoy our delicious Modern British food with one of these great soft drinks. You can book online through Resdiary, email or call us.